Traditional printed annual reports are probably the best-written reports ever. The editorial is tight, sophisticated and companies tend to spend a lot of time, not to mention money, on these reports. However, reading a printed annual report is a chore to endure. No matter how fantastic the graphics are or how well-organized the information is, printed reports are still essentially static, non-interactive and read-only documents. The huge volume of text and tables you have to wade through is overwhelming for most of us. But, turning your annual report into an innovative content-app you can easily change all of that. With an annual report app you can let the audience engage with the brand and the content in better ways. For instance, instead of having the reader flip through hundreds of pages you can give them an overview of a company’s year in just a few snapshots and provide more, deep information and analysis with a click of a button. By adding interesting videos, slides shows and graphics that can be zoomed in you make it more interactive and engaging. With clickable links you can drive readers back to your website or social media channels for more engaging content. Most importantly, the print and distribution cost is zero, which is a huge benefit. 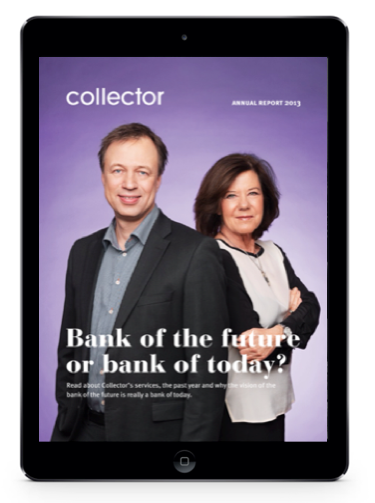 To demonstrate, here’s an example of Collector’s Annual Report App (both in English and Swedish) that was created with our tool and that has also just recently won the “Best Digital Annual Report” at the Swedish Design Awards 2014.